Loudoun Hill marks the eastern end of the Irvine Valley. From its summit there is an extensive view over Ayrshire to the Firth of Clyde and Arran. The hill has witnessed the passage of history from the earliest times. An iron-age homestead is located at the foot of the south-east slope. Nearby at Allanton Beg a Roman fort was built. The current A71 is probably the line of the Roman road as it left the fort. Sir William Wallace defeated an English force at Loudoun Hill in 1296 and King Robert the Bruce inflicted greater punishment on the English in 1307. A large Conventicle (outdoor religious service) held in the vicinity in 1679 led on to the humiliation of Claverhouse by the covenanters at the battle of Drumclog. A number of places in Loudoun and Galston parishes are associated with William Wallace, but Blind Harry in his epic poem “The Wallace” tells the story of Wallace’s ambush of the English at Loudoun Hill. The poem also tells how somewhere within the parish a hospitable innkeeper supplied the party of Scots as they prepared to intercept a convoy on route westward to Ayr. The actual battlesite was probably at the eastern entrance to the narrow pass known as the Winny Wizzen, it's strategic position at the head of the valley meant it was often passed by armies making their way inland or out to the coast. Wallace concealed his men behind the banks and ditches of the long abandoned Roman fort. The poem tells how the Scots made the way even narrower with the construction of stone dykes, making more effective the attack on the tightly packed riders. intended to relieve the garrison at Ayr, now fell into Scottish hands. A point marked on maps as Wallace’s Grave is traditionally believed to be the place where the English dead were buried. Wallace was declared an outlaw after the Battle of Loudoun Hill but pressed on to his great victory at Stirling Bridge the following year. 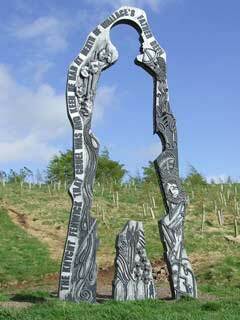 September 2004 saw the unveiling of the "Spirit of Scotland" statute - to recognise the historical significance of the area during the Scottish Wars of Independence. 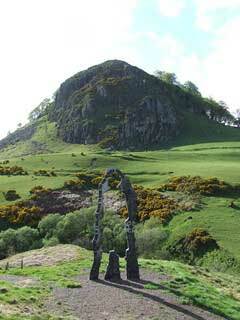 In 1307 on 10th May, eleven years after the first battle of Loudoun Hill, King Robert the Bruce adopted, almost exactly, the same site and tactics for another encounter with the English. Modern interpretation places the battlefield further east on the farm of Allanton plains, between the bog land on the north and Loch Gait, now drained, beside the Avon Water. Bruce might well have deployed his forces on the advice of veterans of Wallace’s army. By digging a series of trenches on either side he succeeded in narrowing the passage, forcing the English onto the difficult terrain between the bog and the loch. This would prevent a full frontal attack by the main English force of 3000 men and give the 500 to 600 Scots the best possible chance of victory. 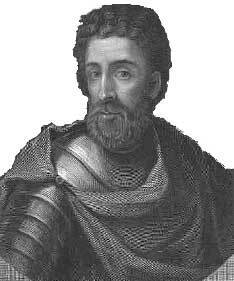 The commander of the English was an old foe, namely one Aymer de Valence, who Bruce was more than familiar with. Rode out to see and chose his ground. Upon a medow, smooth and dry. Was full a bowshot either side. Valence's only approach was over the highway through the bog, where the parallel ditches Bruce's men dug outwards from the marsh restricted his room for deployment still further, effectively neutralising his advantage in numbers. He was forced at attack along a narrowly constricted front upwards towards the waiting enemy spears. 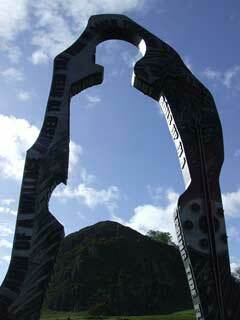 It was a battle reminiscent in some ways of Stirling Bridge, with the same 'filtering' effect at work. And strongest of them fell to the ground. And cries and groans the wounded uttered. Battled and fought with all their might. A grevious noise it was to hear. As Bruce's spearmen pressed downhill on the disorganised English knights they fought with such vigour that the rear ranks began to flee in panic. A hundred or more were killed in the battle. Amyer de Valence managed to escape the carnage and fled to the safety of Bothwell Castle. The Covenanters were a group of people who had signed The National Covenant (1638) in protest when King James I attempted to bring the Kirk into line with the Anglican Church, complete with its hierarchy of Bishops and the English prayer book. The King responded by sending in the army. The Covenanters easily defeated them at the Battle Of Berwick and the army crossed into England and took Newcastle. Charles I conceded to their demands but with the King weakened the Parliamentarians rose up and civil war began. The Parliamentarians asked for Scottish aid and an alliance was founded. The Solemn League and Covenant was signed so that presbyterianism was able to be fostered in England. 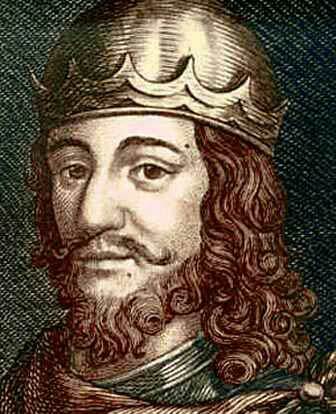 This tipped the balance, the Royalists were defeated, and the King executed. Cromwell, however, saw the Scots as a threat and invaded and occupied the country. When he died in 1658 his son and successor proved to be a weak ruler and the monarchy was restored to Charles II who began where his father had left off, in the persecution of the Scottish faith, following Cromwell's example. John Graham of Claverhouse, commander of government troops in south-west Scotland, received information that a large conventicle (outlawed outdoor religious service) had congregated near Loudoun Hill. Numbering well over 1000 people the conventicle demonstrated the strength of the covenanting support in Ayrshire, the Irvine Valley and Avondale. The minister, the Rev. Thomas Douglas broke off his sermon with the words “Ye have got the theory, now for the practice” and the small army moved off to meet Claverhouse who was approaching from Strathaven. When Claverhouse and his men approached they were surprised to find that the covenanters were not actually engaged in prayer or worship – but instead were lined up ready for battle. Claverhouse’s soldiers numbered around 150 – the covenanting army about 300 of which only 50 were mounted. The weaponry of some of the covenanters was basic and included pikes and pitchforks. The covenanters won the day however – with only a few of their number falling in battle. 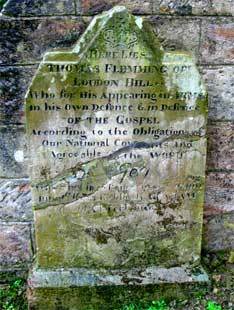 One man who fell defending his faith was Thomas Fleming. He was buried at Loudoun Kirk. Sadly the stone was later vandalised but the Scottish Covenanting Memorials Association repaired it. The stone has now been re-positioned against a wall to hopefully prevent any further damage intentional or otherwise.